Situated in the enchanting French Alps region, Le Bontemps is a leading LuxCamp that caters to people from all walks of life. While this is a great place to simply unwind and soak up the scenery, the site boasts excellent facilities as well as activities to enjoy. The enchanting Alps region of France is famous for its stunning scenery and guests will be able to take part in a large number of activities during their luxury camping trip such as cycling, hiking and walking. However, there is no real need to venture far, as a whole host of activities such as football, basketball and tennis can be enjoyed right on the site. 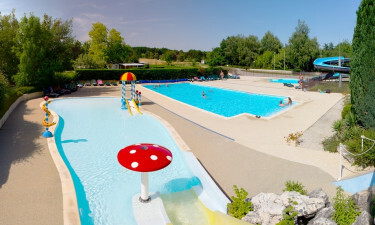 The recreational pool is set with mushroom statues and other items that kids are sure to love. The site also boasts a second outdoor pool where guests can swim laps. People who want to unwind by enjoying a spot of fishing during their camping holiday will really be spoilt for choice at Le Bontemps. In addition to being able to cast off at the onsite pond, trout, carp and other types of fish can be caught in the nearby Varèze river, which boasts some excellent walking trails along its banks.